This has been my favorite project since I’ve graduated. 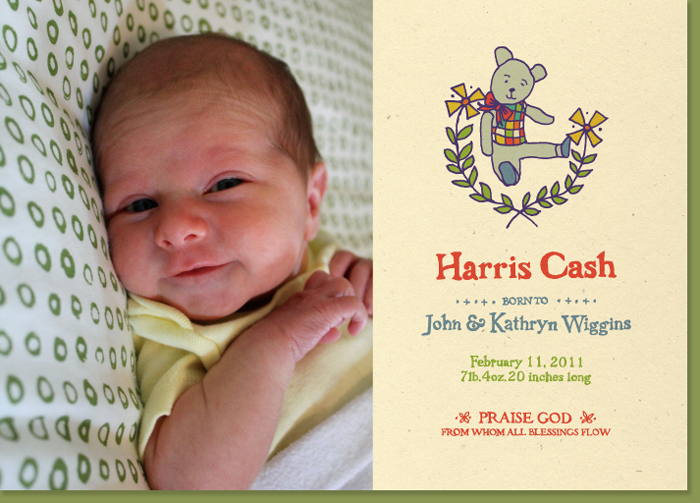 My friends Kathryn & John Wiggins asked me to do their baby announcement! I am so happy for them! They are some of the nicest people I know. I think the world of them. And I couldn’t be happier for them. Harris is the cutest baby. The cards are 5×7 inches, printed on French Speckletone Starch White paper. And we used French’s Poptone gumdrop green for envelopes. Kathryn is an amazing painter. Expect a post about her soon! You can view her work here. And do not pass up her online shop at etsy. I want to own every one of her paintings.